Prepare garden herb ranch dressing and grilled garlic chicken. Set aside. To prepare beets, bring about 6 quarts water to a boil. Carefully place beets in water and cook 45 minutes. After 45 minutes, add additional hot water if needed to cover beets. Cook an additional 45 minutes. Beets should be soft all the way through when done. Carefully transfer beets to a colander, and drain. Place beets in a bowl, and refrigerate 10 minutes or until beets are just warm to the touch. Slip skin from beets, and cut into 1/2 inch dice. 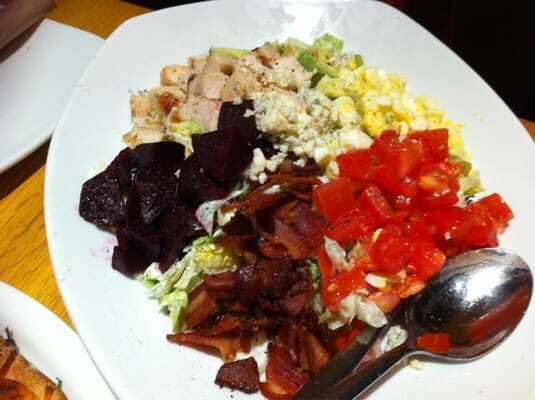 To assemble salad: In large mixing bowl, toss together the lettuces and dressing. Transfer equal parts to chilled serving bowls. Neatly layer rows of bacon, tomatoes, avocados, reserved chicken cubes and beets. Top with equal amounts of cheese. In mixing bowl, use a fork to stir together the mustard and cold water until ingredients form a paste. Set aside 10 minutes. Add all remaining ingredients to bowl and whisk just until smooth. Do not over-mix or you will incorporate too much air into the dressing. Cover with plastic wrap and refrigerate. In mixing bowl, stir together the olive oil, garlic, soy sauce and salt. Turn chicken breasts in this marinade and leave to marinate at room temperature about 15 minutes. Preheat broiler, stove top grill or outdoor grill. If using broiler, set rack in center of oven. Broil or grill chicken breasts until cooked through, about 5 to 6 minutes per side. Remove from heat and cool slightly then cut into 1/4 inch cubes. Cover with plastic wrap and refrigerate until ready to use.